A Danish prince received a royal welcome and in return charmed large crowds Saturday evening in the “Danish Capital of America” as Solvang continued to celebrate its centennial year with a visit by the husband of Queen Margrethe II. 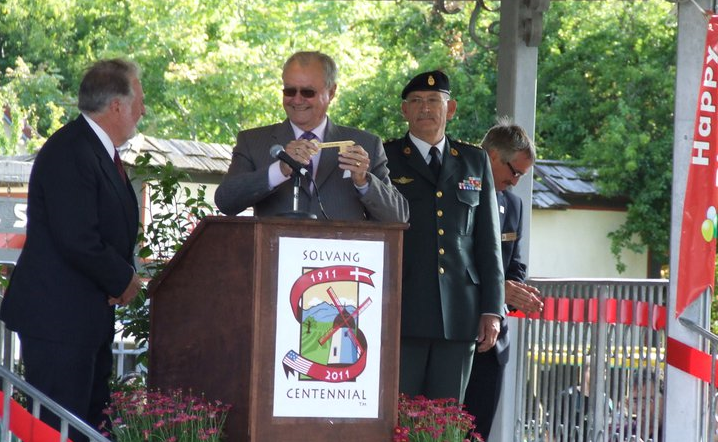 A crowd of 600 or more filled Solvang Park for a formal welcome and a celebration of Prince Consort Henrik’s 77th birthday, which coincidentally was Saturday . . . In addition to the prince consort’s short speech, the downtown celebration included Danish music played by the Valley Wind Ensemble, and singing of the Danish and American national anthems led by soloist Suzanne Hollrah and the band.